While many people go nuts during the annual CMJ Music Marathon in NYC - when 1000 or so bands play over three or four days - in recent years I have found myself becoming super-relaxed. There is no real need to cover the shows as there will be no shortage of cameras - in fact this is the one time when everyone else does what I, and just a few others, do the rest of the year. But always, somewhere in the morass, one can perceive a show that, while an absolute jewel - with a killer line-up , will nevertheless escape the attention of the credentialed masses. This was that show for 2009 - a friday afternoon party put together by Yoko Sawai. Yoko runs a specialty label Heartfast that puts out limited edition combination picture-single/dvd releases. Included in the roster are Fake Male Voice, which is Tunde Adebimpe from TV On The Radio, The Liars, Of Montreal, and Apples In Stereo. Representing the label at her CMJ show were Fake Male Voice, in their second ever appearance, and Jamie Huggins of Of Montreal who debuted his new band James Husband. James's Elephant 6 colleagues The Ladybug Transistor were somehow convinced to also appear. Drawing on her Japanese connections Yoko scored a coup by getting Tokyo's Mi-Gu. led by drummer Yuko Araki, in their second ever US performance. Yuko, along with bandmate Hirotaka 'Shimmy' Shimizu, is in the newly reformed Plastic Ono Band, so they brought down fellow members Sean Lennon and Yuka Honda to guest. Opening up the show was Yoko's own new band Hard Nips - an all-girl outfit that has already been causing a stir in Brooklyn, especially with their recent appearance at the Williamsburg Fashion Weekend. They got the whole thing started with a great deal of energy. I've picked the songs 'Children Of Satan' and the harmony-laden 'Blackhole Rainbow' as clips. James Husband played a number of tunes off their new record 'A parallax I' - I've picked the trippy 'Elephant Alibi'. The release includes a CD of cover versions and there was indeed one in the set - Buffalo Springfield's 'Out of My Mind'. The Ladybug Transistor took the opportunity to try out a couple of new tunes, such as 'Into The Strait', while 'I'm Not Mad Enough' is from their most recent album 'Can't Wait Another Day'. A welcome feature of their set was the spirited xylophone playing of Gabe Saucedo. Then came the much anticipated Mi-Gu. Yuko anchors with super-solid drumming while Shimmy shimmers on guitar. The tunes are playful and reflective until Sean and Yuka join. 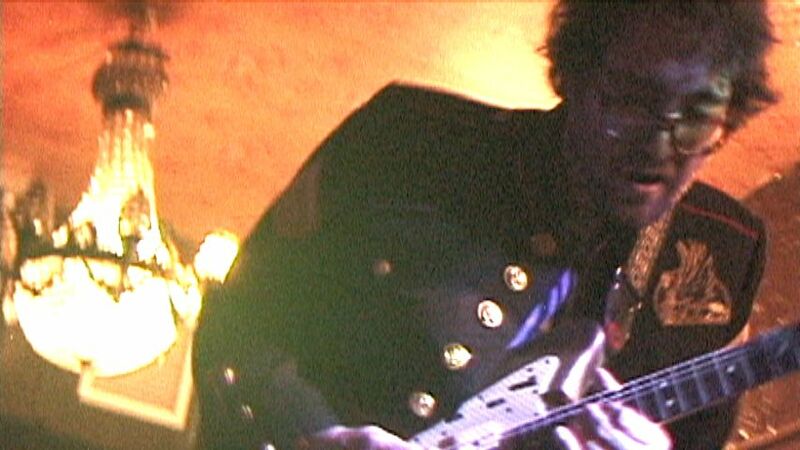 A cover of Funkadelic's 'Maggot Brain' sees Sean unleash as awesome a guitar solo as one might ever experience before he switches to bass and Shimmy lets loose on echoey slide guitar. Wow! And then we still got one more tune - 'From Brain'. If this segment of the group is anything to judge by the Plastic Ono Band must be astonishing! Finally it came to Fake Male Voice to close the show - TVOTR drummer Gerard Smith programmed beats and played minimal keyboard themes as Tunde, in his usual fashion, improvised and electronically twisted his vocals. Unlike other occasions I actually managed to get titles out of Tunde - the two clips are 'Another Drummige' and 'Jupiter's Tongue'. Five amazing bands and it still wasn't 7pm as the happy crowd staggered out on the street. And yes, mine was just about the only camera there. Seperate DVDs on each. The best way to get the Heartfast releases is probably to order from InSound. The James Husband record is just out and can be got - at a very reasonable price I might add - from Polyvinyl Records. The Ladybug Transistor's record is available at their website.. Mi-Gu has 3 albums which can be got from their myspace (see below).